Painting can be a tricky job, even when you’re a dab hand at DIY. And when it comes to ceilings, it can get even tougher. We’ve put together a handy guide to help make your paint job much easier. It’s all about getting the right tools for the job and using the right techniques. This has a shiny finish and is the hardest wearing of all the emulsion paints. It’s ideal for rooms that have a lot of moisture and condensation. Some manufacturers also make special kitchen and bathroom paints which are designed for rooms which get steamed up. Matt paint gives a non-shiny, matt finish that doesn’t show up any imperfections on the wall. This is because shinier finishes reflect back more light and highlight any bumps or dents on the wall. On the down-side, vinyl matt emulsion might not wear as well as the more glossy emulsions. 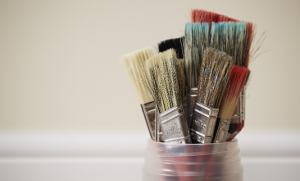 Paint brushes are usually made from bristle or synthetic fibres which are set into resin or vulcanised rubber. The bristle, hair or fibres should be flexible, thick and smooth to the touch. 4-6 inch wall brush – a wide brush for painting large, flat surfaces like walls and ceilings. 2 inch wall brush – an ideal size for painting smaller flat surfaces like tricky bits of wall and woodwork including doors and skirting boards. 1 inch brush – a smaller brush for doing close to the edges of walls and ceilings, as well as mouldings and doorframes. 1/2 inch brush – a narrow brush for tight areas and fine detailon window frames. Cutting-in – a small brush with angled bristles for painting near to edges and into tight corners. Also good for painting window frames. 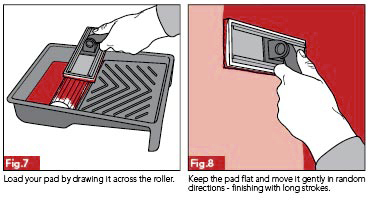 Rollers are really quick and easy to use, applying paint three times faster than a brush. They come in a whole range of widths and weights. Rollers sleeves too offer a choice of fabrics, depending on the paint and surface you’re painting. The manufacturer’s packaging will help you pick the right sleeve for your painting job. Paint pads come in a variety of shapes and sizes. They have a rectangular sponge face covered in a short mohair pile. This is fixed to a rigid plastic back which usually has a removable handle. Paint pads are great for smooth surfaces, but can get caught and snag if the surface is uneven. Brushes and paint pads can give a better finish on textured surfaces than a roller. Before you start painting make sure your walls and ceilings are clean, dust free, smooth and completely dry. Give them a good wash down with sugar soap, then a rinse with clean water. If you’ve got new plasterwork, check and remove any blisters, fill any cracks or blemishes and rub off any fluffy patches with a rough cloth. If you’re using oil based paint, you’ll need to treat your plaster with a suitable primer. If you’re using emulsion use one of the specially designed base coats. You can also use emulsion over most wallpapers, so long as they are in good condition and firmly stuck down – but bear in mind if it’s a textured paper then the texture will show through the paint. Cover floors and furniture with dustsheets. And make sure you’ve got a bucket of water and a sponge to wash off any splashes. 5. Wall or ceiling first? Paint your ceiling first, then the walls and lastly the woodwork. 1. For your first coat of primer or base coat follow the instructions on the tin. 2. Half fill a paint kettle with your paint and dip in a 50mm brush about one-third the way up the bristles. 3. Hold your brush at 90 degrees to the ceiling and paint a straight line across the corner between the walls and ceiling (fig.1). 4. 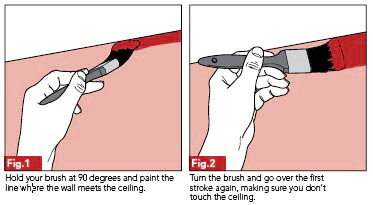 Turn your brush parallel to the ceiling and carefully go over the first stroke, keeping the bristle close to the ceiling but not touching it (fig.2). Repeat this along the bottom and tops of your walls. 5. You can then use a bigger brush to fill in the rest. Use the edge of your brush to cut into the corner of your wall (fig.3), and then paint outwards in a criss-cross fashion. Lastly, lightly brush out the paint in long strokes. 1. Fill your paint tray a third of the way with emulsion. Dip your roller in and roll it firmly up and down the ribbed section (figs.4 and 5). 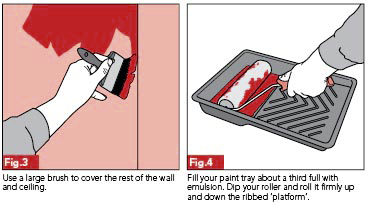 Make sure you don’t get too much paint on your roller, it should roll freely over your walls or ceiling, without slipping or skidding. 2. Slow vertical strokes will cut down spattering – and should be finished off with parallel strokes in one direction. Apply the paint evenly and always work from a wet edge to avoid ridges. 3. For the best results work on 1m square sections at a time. 4. Use a 50mm brush to paint into the corners. 5. A long handle extension on your roller will make painting your ceiling a lot easier. 1. Use a large pad for the walls and ceilings, and a small pad for the edges (fig.6). 2. 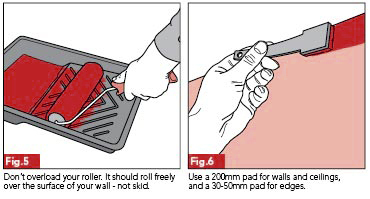 Load your pad by drawing it across the captive roller in the special tray (fig.7). 3. Make sure you keep your pad flat on the wall or ceiling and move it gently in random directions – finishing with long strokes (fig.8). Remember, when undertaking DIY tasks you must always take your own ability into account and you must also read and follow any packaging and manufacturers’ instructions. This is intended to be a basic guide only and is not a substitute for any professional advice. 9. How many coats of paint? The number of coats you need will depend on the type of paint you use and what you’re painting over. Follow the instructions on the tin for the best results. If you’re painting over a dark colour or a pattern, you could need up to 3 or 4 coats of emulsion to cover it up. Make sure you leave the paint to dry between coats. ‘One coat’ emulsion may be a better option so long as the colour contrasts are not too great.